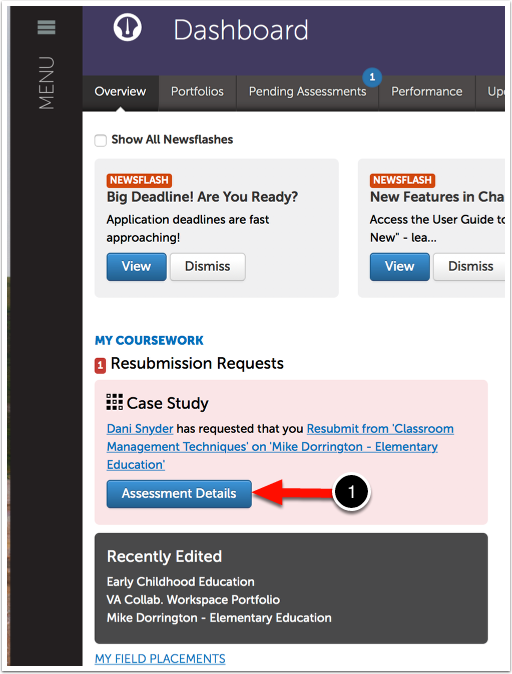 When you log in to your account after having received an email regarding a resubmission requirement, you will see a notification on your Chalk & Wire Dashboard. 1. Click on the Assessment Details button within the notification to access the details from the initial assessment. 2. Review the comments provided by the Assessor in the Overall Comment box. 3. Review any comments provided within the rubric. 4. Use the Actions menu to select Work to review any comments on your submitted work. 5. Use the Update Work and Resubmit button to access your portfolio page/assignment so that you may update your work and resubmit it. 6. Alternatively, if you do not wish to resubmit your work, use the Decline Request to complete the assessment and receive your final score. Prev: What is a Resubmission Request?